Applicants to Harvard Business School must submit a "complete HBS application portfolio, including personal essays, academics transcripts, and three letters of recommendation." 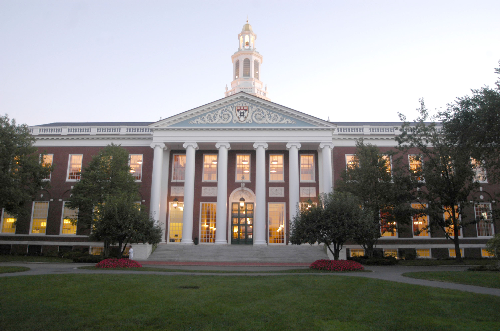 In addition, students must provide scores from the GMAT or GRE, and applicants from non-English-speaking countries must submit scores for either the TOEFL or the IELTS (scor...Applicants to Harvard Business School must submit a "complete HBS application portfolio, including personal essays, academics transcripts, and three letters of recommendation." In addition, students must provide scores from the GMAT or GRE, and applicants from non-English-speaking countries must submit scores for either the TOEFL or the IELTS (scores must be no more than two years old). Applications must be submitted online. Academic ability, leadership experience, and unique personal characteristics all figure prominently into the admissions decision. The school notes that "because our MBA curriculum is fast-paced and rigorously analytical, we strongly encourage all applicants to complete introductory courses in quantitative subjects such as accounting, finance, and economics before coming to HBS. For some candidates, we may make admission contingent upon their completing such courses before they enroll." Good luck! HBS has opened its doors to an innovative new program for college juniors. It's called HBS 2+2: two years of work, then two years of immersion in the Harvard Business School MBA program. Harvard Business School maintains a robust career services office all the same, providing a full range of counseling and internship- and career-placement services, with more than 40 career coaches seen by more than 80 percent of the class. There are more than 800 recruiting events on campus each year; of those, 400 focus on full-time employment and the other 400 focus on summer internships. Nearly half of all MBAs remain on the East Coast after graduation, about a quarter of whom take jobs in New York City. Nineteen per­cent find international placements; 10 percent of the class work in Europe and 6 percent work in Asia. Harvard Business School operates a global network of research centers and offices in key cities around the worldÂ—including Hong Kong, Tokyo, Buenos Aires, SÃ£o Paulo, Paris, Mumbai, Shanghai, and Palo Alto which coordinate research and build local relationships that help weave the School into the fabric of the global marketplace. The forty-acre residential campus in Boston has thirty-four buildings with a broad range of dedicated facilitiesÂ—including state-of-the-art classrooms, meeting spaces, and Baker Library, one of the world's largest and most respected business libraries. Harvard Business School operates a global network of research centers and offices in key cities around the world—including Hong Kong, Tokyo, Buenos Aires, SÃ£o Paulo, Paris, Mumbai, Shanghai, and Palo Alto which coordinate research and build local relationships that help weave the School into the fabric of the global marketplace. The forty-acre residential campus in Boston has thirty-four buildings with a broad range of dedicated facilities—including state-of-the-art classrooms, meeting spaces, and Baker Library, one of the world's largest and most respected business libraries. Alex Maybank and Alexandra Wilson - Founders, Gilt Groupe, Inc.
Jamie Dimon - Chairman & CEO, J.P. Morgan Chase & Co.
Michael Bloomberg - Mayor of New York City, Founded Bloomberg L.P.
Want more info about Harvard University, Harvard Business School Full Time MBA? Get free advice from education experts and Noodle community members. Will I be accepted to Harvard Business School’s Full Time MBA straight out of undergrad? I heard that HBS has a huge issue with its culture, specifically there was a rich kids club called Section X. This was discussed in Jodi Kantor's article in the NYTimes. I hear that this phenomenon still exists on campus. Does anyone have thoughts on this as a current student or alumnus? That's true at any business school, maybe it's more pronounced at Harvard. It's one of schools that's focused on networking (ie. "leadership") rather than quantitative reasoning, per se. I am an entrepreneur at heart. What resources does the school offer to help students launch ventures? The Rock Center is one of the leading hubs for innovation/entrepreneurship on any campus.